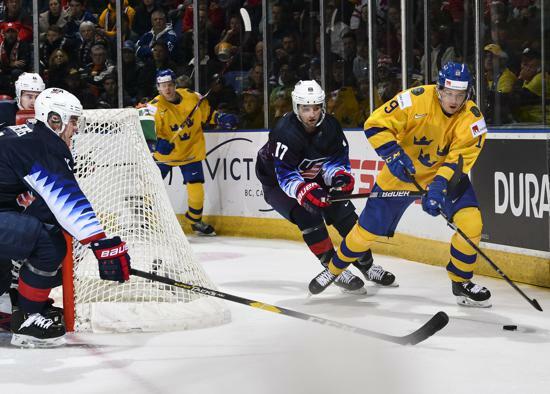 The U.S. scored four unanswered goals - including a natural hat trick by Ryan Poehling (Lakeville, Minn./St. 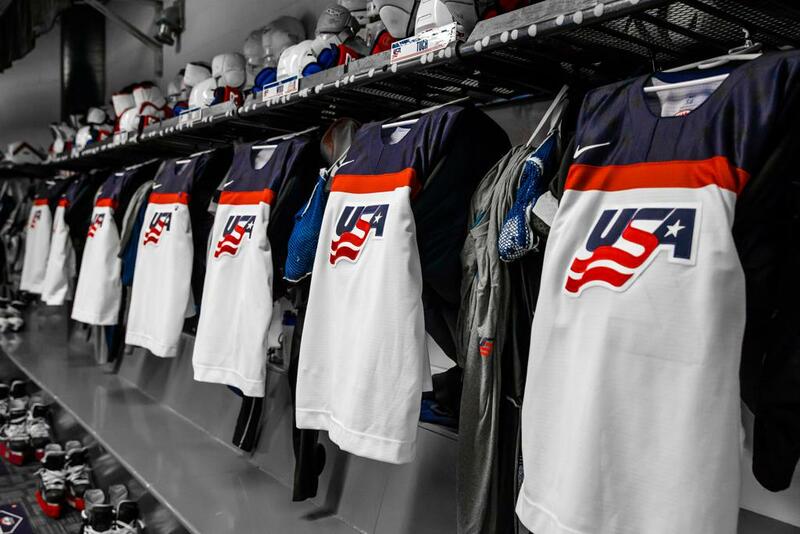 Cloud State University) - over the last 10:26 of regulation to force overtime, but was unable to complete the comeback as the U.S. National Junior Team fell to Sweden 5-4, in its third preliminary round game of the 2019 IIHF World Junior Championship. The game opened with both teams generating scoring opportunities over the first three minutes of play. 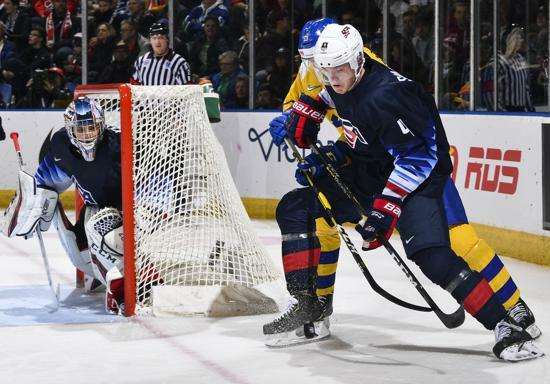 With the U.S. pinning Sweden deep within its zone, Jason Robertson (Northville, Mich./.Niagara IceDogs) generated the first scoring opportunity of the game with a shot that produced a rebound Joel Farabee (Cicero, N.Y./Boston University) chipped just wide. Despite the U.S. controlling play, Sweden was able to strike first when Filip Westerlund placed a wrist shot short side past Kyle Keyser (Coral Springs, Fla./Oshawa Generals) 4:47 into the frame. 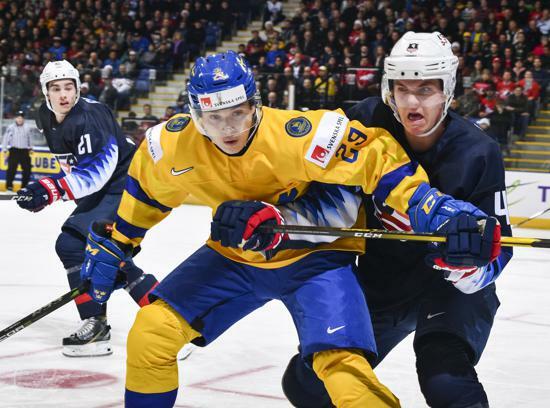 The final three minutes of the period saw Sweden earn a five-on-three man advantage that the U.S. was able to defend as the two teams entered the first intermission with the score, 1-0. The middle frame opened with Keyser turning aside a pair of quality Swedish scoring chances. Eight minutes into the frame, the U.S. nearly scored when Evan Barratt (Bristol, Pa./Penn State University), Farabee and Norris all generated chances. Barratt had the first try, firing a short-side shot from the bottom circle that was turned aside. After Farabee's effort on the weak side was blockered away, Norris created perhaps the best chance with a one-timed shot from the slot that Swedish goaltender Samuel Ersson was able to turn aside. Sweden doubled its lead at the 9:21 mark when Rickard Hugg was able to push the puck through Keyser and into goal on an odd-man rush. Two minutes later, Bemstrom finished a breakaway opportunity to give Sweden a 3-0 advantage. With 1:46 to play in the frame, a U.S. powerplay opportunity generated another pair of scoring efforts. Farabee and Norris were behind the first opportunity, as Farabee skated behind the net and one-armed a pass to the top of the crease where Norris's short-side effort was denied. Moments later, Oliver Wahlstrom (Quincy, Mass./Boston College) nearly scored from the same spot but his chance was blocked. Sweden made it 4-0 just 2:34 into the third period when Branstrom put a backhanded effort past an outstretched Keyser. 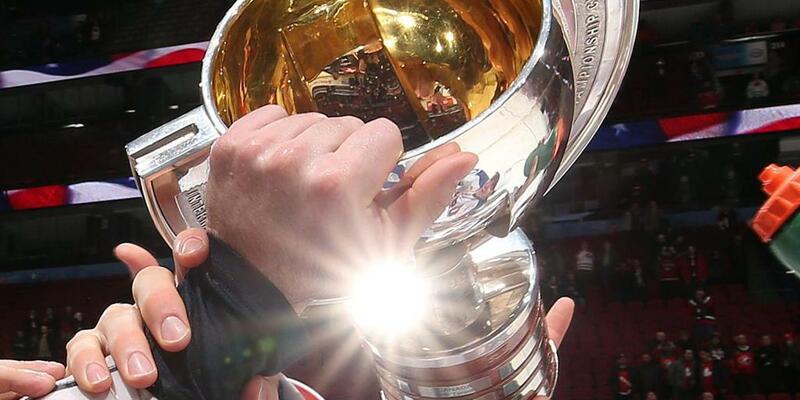 The U.S. comeback bid began with 10:26 to play in regulation. 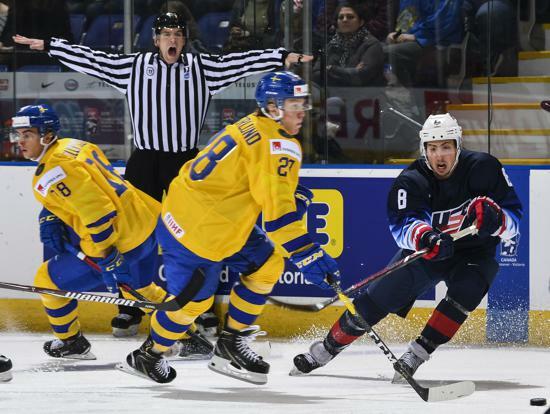 U.S. captain Mikey Anderson (Roseville, Minn./University of Minnesota Duluth) started the scoring when Sasha Chmelevski (Northville, Mich./Ottawa 67s) found him alone at the right faceoff dot for a one-timer that went five-hole for a powerplay goal. 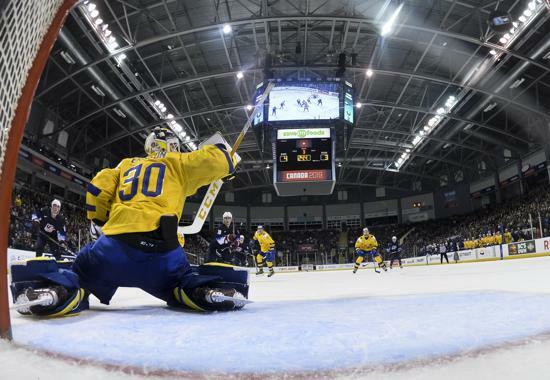 One minute later, Oliver Wahlstrom (Quincy, Mass./Boston College) nearly cut Sweden's lead to two when he drove to the net and flicked a backhanded effort over Ersson and off the crossbar. Armed with another powerplay, the U.S. scored again with 6:35 to play as Wahlstrom found Poehling back door for a redirected goal. 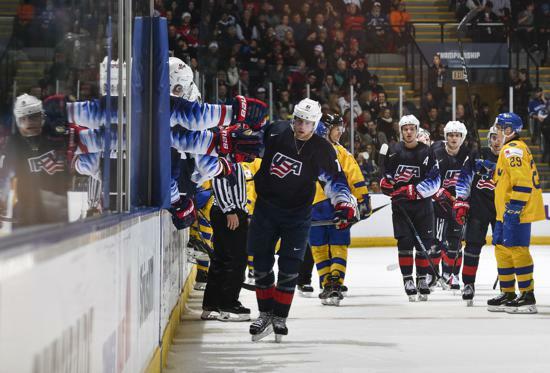 With 35.6 seconds left and Keyser pulled in favor of an extra skater, the U.S. struck again. Quinn Hughes (Orlando, Fla./University of Michigan) sent a pass to the slot that went off Wahlstrom and found Poehling at the right crease for a tap-in goal. Just 10 seconds later, Poehling scored again, this time a top-corner snapshot from the right faceoff dot, to knot the score, 4-4, in a span of 10:11. 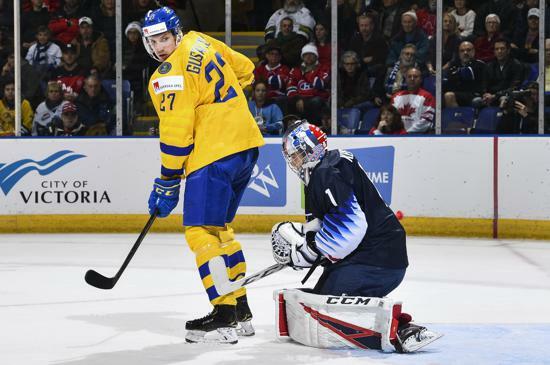 The game-tying goal came with :24 to play in regulation, as an errant Swedish pass in their own zone found its way to Farabee ,who dished the puck to Poehling to complete Team USA's second natural hat trick in as many games. The three-on-three overtime saw each nation exchange prime scoring chances as Keyser turned aside a Swedish breakaway opportunity before Chmelevski nearly converted moments later on a close-ranged effort from the left side of goal. With 1:09 left in extra time, Adam Boqvist accounted for the 5-4 Swedish win by one-timing a give-and-go passing play with Lucas Elvenes. NOTES: Forward Ryan Poehling was tabbed U.S. Player of the Game ... The U.S. was outshot, 33-29, went 2-for-3 on the power play and a perfect 2-for-2 on the penalty kill. For complete game statistics, click here ... Poehling's natural hat trick occurred in a span of 6:11, one night after Joel Farabee tallied a natural hat trick in 6:52 ... John Vanbiesbrouck (Detroit, Mich.), assistant executive director of hockey operations for USA Hockey, is serving as the general manager of the U.S. National Junior Team ... 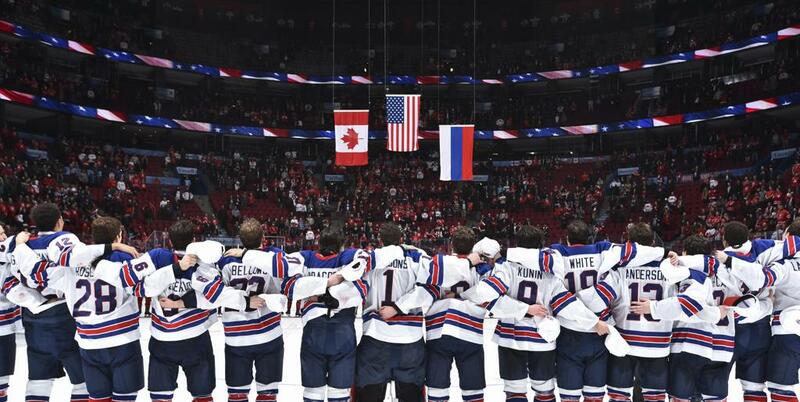 The U.S. enters the tournament having medaled in three straight World Junior Championships for the first time in U.S. history after earning gold in 2017 and bronze in 2018 and 2016 ... NHL Network is the official U.S. broadcaster of the 2019 IIHF World Junior Championship. For more information about the tournament, click here.